(Newser) – It's the summer of the wolf pack in California, and no we're not talking about another Hangover sequel. A family of gray wolves—two adults and five pups—were yesterday confirmed to be living in the state. The last time the state hosted a pack was the early 1920s, after which the animals were completely eradicated from California, the Los Angeles Times reports. Biologists first got wind of the so-called Shasta Pack, currently roaming remote Siskiyou County near Mount Shasta, in May and June when trail cameras photographed an apparent adult wolf; biologists then found wolf feces and photographed the five pups in recent weeks. 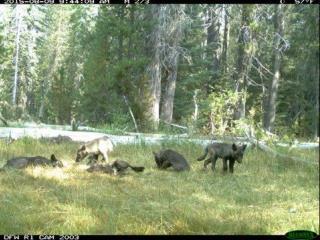 The Shasta Pack joins 31 wolf packs in Washington and Oregon and another 282 in Montana, Idaho, and Wyoming. That's the WOLF for YA! They will SURVIVE in any conditions!! There ya go ALL! !